Sophisticated solid bedding at its finest. The Courtney White bedding set by City Scene is beautiful in its simplicity. Solid white throughout with a chevron pleated design to add a modern look for your bedroom. For additional layering add your favorite sheet set or buy a new one. 100-percent cotton is soft and will last a life time. Machine washable for easy care. I bought this comforter for my King size bed. 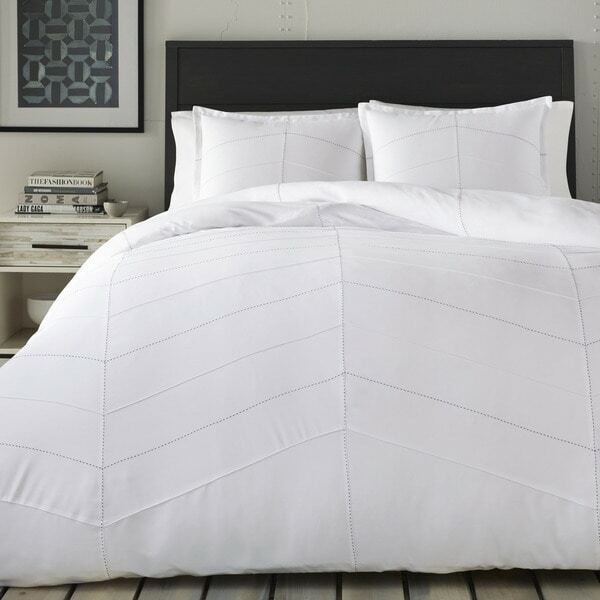 It’s a beautiful white soft set with black soft stitching on part of the comforter. On the picture I didn’t think it had black thread I thought it was just stitching, but once I received it I didn’t mind it. The only thing that bothers me a little but is that I get a little hot, I might be because the material is polyester. Other than that I love the comforter and I recommend. It looks beautiful in my bedroom! Beautiful set, Nice and fluffy! Daughter very pleased with the purchase as it was for her room. I really love this comforter! It looks really heavy however it’s really lightweight so you don’t get hot during the summer ! I like the design on it as well it’s subtle but adds just the right touch to add some style ! And it being white with black stitching it goes with any color of sheets. 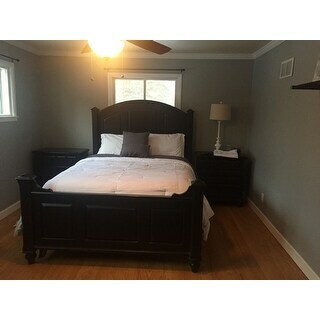 This comforter set was an absolute win! I had my doubts (particularly about the dark lines that I read about in the reviews) but all of those disappeared when I received this product! I love it. My family loves it. And friends compliment me on this all the time! It's so soft and it has a classy, modern look. I would highly recommend. Love this comforter. I was looking for a simple white comforter and this one is beautiful. It is simple, yet has enough detail to give it some character and appear to be high end. Many reviews mentioned they were unaware there was black stitching - the photos show the black stitching very accurately and it is a great touch on the set. I bought this in a twin size. The pillow sham is for a large square pillow, not a standard pillow. The bedding itself is a good weight for all four seasons. Wash cold water, commercial dryer is recommended. I purchased for a bunk room at our cottage, needed four total. Looks great, love them highly recommend! This is one of my favorite comforters! I own 2 of the same and the 3rd is the same brand different design. Its super soft and warm, it washes well! I'm glad I read the reviews on this set and bought it. Very fluffy and full. I purchase a lot of solid whites for are model apartments as it opens the room up and keeps it light and air. Definitely recommend and would buy another one when needed. I was looking for a white comforter that didn't have ruffles or frills. This comforter is beautiful. The chevron design is made from little black darts. It's subtle and sophisticated. It's a little wrinkly along the center line, but it's beautiful besides that. This is a beautiful and over-sized comforter! The subtle grey stitching is perfect and works well in my black and white guest room. I would definitely recommend. Literally the BEST comforter ever! It’s big, heaven and super warm. The White is brite with just a touch of grey stitching. My favorite one ever!!! "Does the twin size fit a dorm twin xl?" The twin comforter measures approximately 66 inches wide x 86 inches long and a twin XL bed measures approximately 39 inches wide x 80 inches long (which is 5 inches longer than a twin size bed). It would fit, but may not feel long enough, depending on your preference. "Will this become available in a King size?" Unfortunately we don't know when it will be restocked.